His was a simple life but far from ordinary. It was spent being totally devoted to his love without any breaks or deviation. 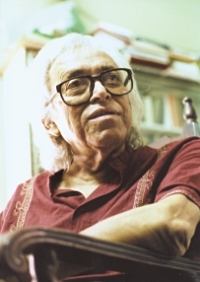 It was his uninterrupted passion to write poetry that has made sure that he will be remembered as an icon of Bangla literature, as an authentic painter of the Bangali soul. Shamsur Rahman will no doubt be missed for being a tangible assurance of Bangali identity. But he will remain immortal for his soul-lifting verses that have earned him the adoration and reverence of his compatriots. It was not just poetry-lovers who admired him but poets too who were inspired by his mode of writing. While his poetry thrived on urban dreams and disillusionment he was just as weak towards rural utopia and charged by the cultural spirit of post-independence. An abiding voice of the generation that shaped the political and cultural map of Bangladesh, Rahman has left behind a treasury of over 3000 poems that will continue to inspire his present admirers and those who will take their place in the future.